22850 Brambleton Plaza, Brambleton, VA 20148. Tour participants will gather at the entry plaza. Designed by HGA in partnership with Loudoun County and Brambleton Group, LLC, the new Brambleton Library brings long-awaited resources to a growing and award-winning master planned community for life-long learning, creativity, and gathering. The 40,000-square-foot library occupies the lower two stories of a new four-story office building and shares a common lobby with a retail area. The children’s area includes playful furniture and cozy nooks for interactive play and reading. All are welcome in the makerspace, where tinkering, sharing ideas, experiential learning, and common interests bring people together. Sturdy wood framed openings serve a variety of functions such as reading benches, display cases, staff access openings, viewing windows into study rooms, and colorful illuminated light boxes. Where the two floors join, "logs" spill out to become the main stairs which double as casual seating and a performance venue. The tour will be conducted by HGA in collaboration with Brambleton Library. Architects David Jelinek, AIA NCARB and Michael Schwartz, AIA, LEED® AP, along with Interior Designer Emily Jelinek, IIDA, LEED AP, will lead the tour and talk about the project story, players, and the behind the scenes effort to include Virtual Reality exhibits used in the design process. • Examine the Brambleton Master Plan and assess the role of the library as the cornerstone of the Brambleton Town Center, energizing the mixed-use community, providing free and equal access to a wide variety of resources, and contributing to the work/life balance of residents. • Consider the contemporary design of the library and how it takes cues from regional architecture, including historic stone mills, log buildings, and brick commercial-industrial buildings. • Explore design features that enhance the quality-of-life for residents and promote social interaction between neighbors, including comfortable seating, gathering spaces, a community meeting room, a makerspace, and a mixing/recording room, all embedded with technology. 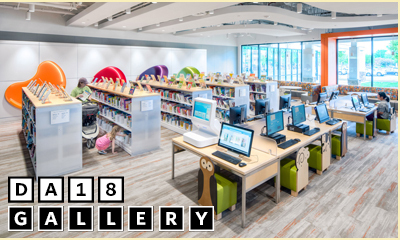 • Examine interactive elements to engage and educate children, including the colorful Discovery Wall that spans two floors and the glass walls inside the front entry which display of how the library's automated book return system works. 1.5 LU|HSW. Free. Pre-registration is required.